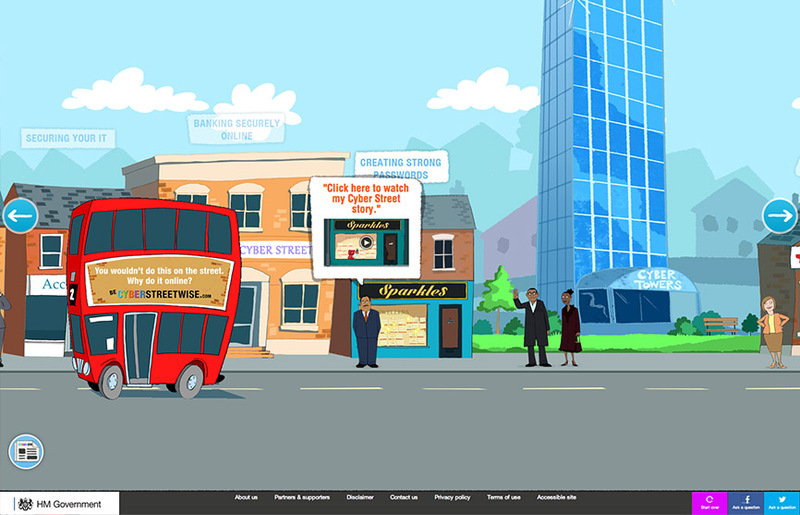 The Home Office here in the UK recently launched a new campaign to raise awareness about cyber security for both individuals and businesses called Be Cyber Streetwise. 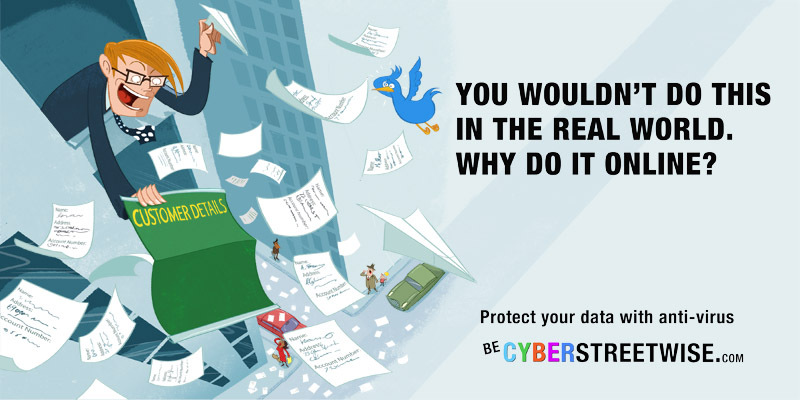 The campaign consisted of print ads and a website which focussed on a juvenile cartoon concept of several urban scenes depicting parody scenes relating to key points about protecting your data. Personally I think the cartoon approach was not a suitable style for a serious campaign like this; making it light hearted doesn’t help soften the topic in a constructive way. Visual implementation aside the illustrations have been well crafted by Steve May and the analogies will no be lost on anyone despite the approach. Regardless of how well the print campaign works, the online implementation of this campaign is inexcusably bad and both M&C Saatchi and the Office of Cyber Security and Information team responsible for the project should be ashamed at wasting tax payers money so. This is clearly a campaign that has been conceived in print and the idea adapted for web. Such an approach would be considered a bad idea today regardless of the campaign topic, but for a campaign that focusses on an online activity? Insane. It’s such a shame as the message is an important one (categorised as ‘National Security’ on their website) and it’s meaning and message is all but lost in the online implementation. The illustrations although attention grabbing and are interesting analogies in static print form, take on a juvenile childish approach when animated that feel patronising and detract from the serious context of the campaign. It feels more Sesame Street than Cyber street. The navigation is all wrong. 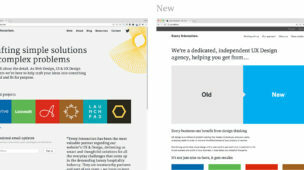 They essentially made several sites and made the user decide which is relevant to them. The first interaction on the site, before you can see anything about the campaign is a choice asking you which vertical you fit into. Such a move will instantly lose a large number of visitors before you have communicated a single message. The correct approach would be to have a global message and segment the content with the experience for those who decide to delve in deeper. The message is essentially the same for either home or business users, only the content specifics need adjusting once a vertical has been selected. If the campaign approach does not support this, the campaign concept needs adjusting. The second major mistake is that the content is not easily browsable, instead hidden behind random signposts, animations, buildings and characters. It feels more like a children’s game rather than an informative website, and the animated, illustrative design choice does not help this deficit. There is an ‘index’ style navigation hidden behind a newspaper in the bottom left, but this seems it was thrown in as a secondary thought rather than acting as a serious form of primary navigation. It’s not searchable. They’ve used an exploratory interface for something that is very factual and only a very small subset of the content will be relevant to any one individual – if I’m looking for something specific (which most users probably will be) it’s difficult to find what you’re looking for. 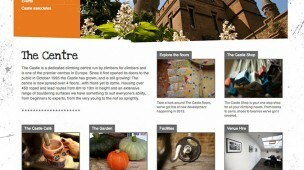 The final major issue l’ll go into today is that the site does not work particularly well responsively or accessibly. Any site you need to provide a completely separate accessible version of today has not been well conceived. Although this site technically works on smaller screen devices, it does not work well and the concept and interface become even more cumbersome and hard to use without the additional screen real estate required to support a scrolling UI like this, or the rollovers that come with using a mouse. In short, this a very bad choice for a modern website, especially a Government one. It feels more like an overblown flash site from 1998. There are many more things wrong with this campaign and website that are too numerous to list in this post. All in all this is a bad job and considering M&C Saatchi had a budget of £4m to deliver this campaign, they could have done a lot better. I believe these mistakes often happen because a single full service agency is appointed to deliver the project across all media. To get one agency to cover all bases across concept, print and web will inevitably end badly in at least one area, it’s just a natural side effect of full service. If the government really wants higher quality work and to support smaller businesses they should work harder to find smaller specialist agencies who can work together to achieve a higher quality end result. It will take more effort then manage, but they could easily hire a dedicated PM to handle this on their behalf with this kind of budget and still save money. Using full service agencies is the easy/lazy way out. Given a little help I hope they make better choices on future projects. Thumbs down to James Brokenshire MP and his department.